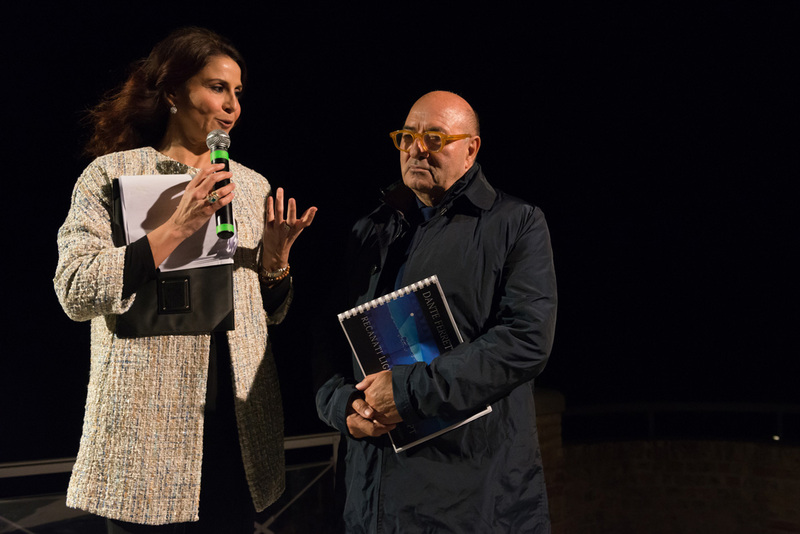 The Municipality of Recanati in collaboration with iGuzzini unveils its innovative urban park regeneration and smart light project for the Mount of Infinity, one of the locations that best represents the famous local poet’s romantic heritage. Originally created in 1937, to mark the first centenary of the poet’s death, the park has recently been the focus of a comprehensive project that features on one hand, the innovative lighting system, donated by iGuzzini and, on the other, the botanical regeneration project designed by C.Re.Ha. nature, the spin-off from the Polytechnic University of the Marches. 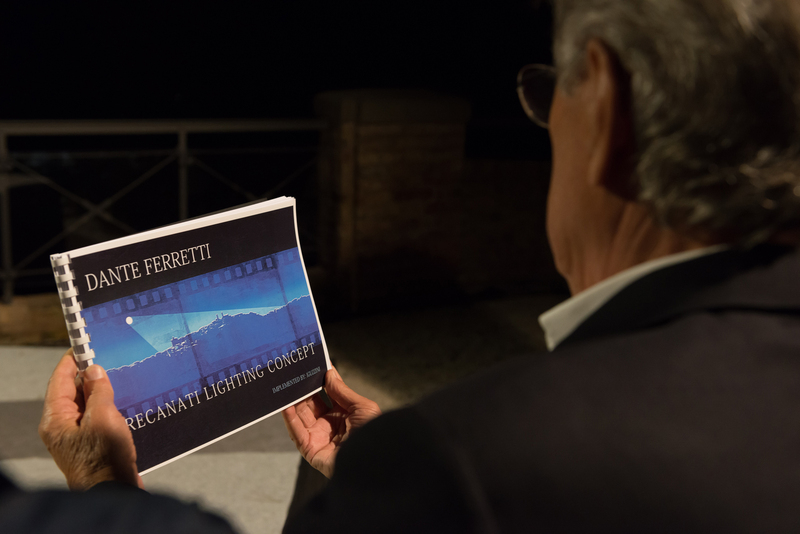 The main feature of this project, which has been a key priority for the Municipality of Recanati and is financed by MiBACT funds, is the new lighting system designed by three-time Oscar winner, Dante Ferretti. This state-of-the-art system has been developed thanks to technological solutions created by iGuzzini, featuring DALI-adjustable LED luminaires and a new application of smart lighting. In the immediate future these innovations will transform the park into an interconnected location where every light point is a “smart node” featuring Bluetooth Low Energy and beacon technologies that allow visitors to receive useful information via an app. The lighting system created with latest generation LED luminaires, has enhanced the park by creating artificial light that magnifies the nocturnal emotion of moonlight. Thanks to iGuzzini luminaires and the natural filter effect of the trees, the poetic moon-effect of the light created by Dante Ferretti’s design is truly spectacular and pays a fitting tribute to the magical atmospheres invoked by Giacomo Leopardi in his famous poem “To the Moon”. The lighting design had three key goals: to reduce the energy consumption of the previous system, to increase the safety and comfort of the area and to design a nocturnal landscape with a truly Leopardian spirit. From June onwards, the lighting system will be integrated with safety accessory functions, Wi-Fi connectivity and power points for mobile devices – all of which will be installed in the lighting devices. Specific environment and vegetation monitoring systems will also be installed in the plant to encourage the conservation and development of the animal and vegetable species that are present here. 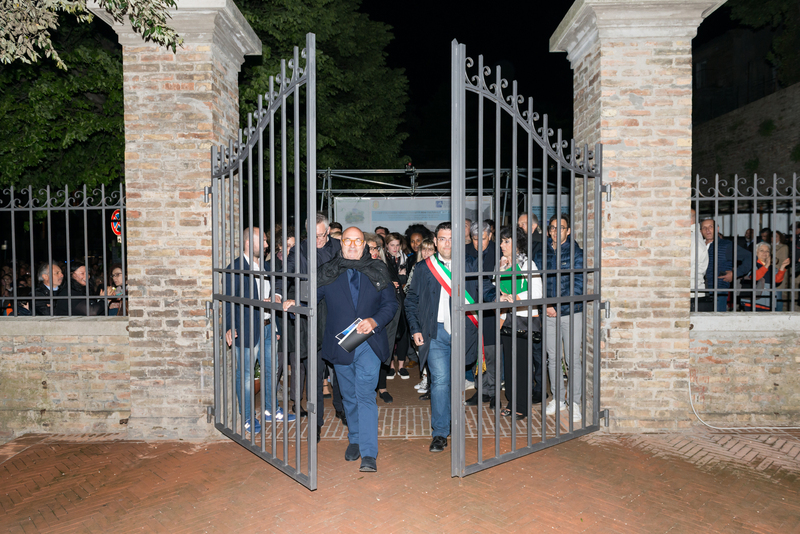 During the opening event, held on the 6th of May, approximately 3,000 people had the opportunity to admire the new lighting system at the Colle dell'Infinito. The official project presentation was introduced by the journalist Barbara Capponi and included speeches by the following: Francesco Fiordomo, Mayor of Recanati; Luca Ceriscioli, President of the Marches Regional Council; Vanni Leopardi, a descendant of the poet; Alessandra Stipa, President of FAI Marche; Massimo Corvatta, President of DEA; Edoardo Biondi, Professor emeritus at UNIVPM; Adolfo Guzzini, President of iGuzzini and set designer Dante Ferretti. “Without doubt, DEA has played an important role in the regeneration of the Mount of Infinity and its new lighting system. The light points in the park use modern LED technology and are controlled individually, which means they are modular, but separate operations can be carried out on each pole. Thanks to this heterogeneous design, complex light plays can be used to illuminate this unique location with special effects. “È una grande emozione presentare la prima parte di un progetto di messa in sicurezza e riqualificazione del Colle atteso da tempo. Un luogo che, coniugando il pensiero di Giacomo Leopardi e il genius loci per la crescita culturale, sociale ed economica del territorio diventa di una straordinaria modernità. Il Colle d’altra parte è storicamente un simbolo della Città ed ha un suo significato sia di appartenenza per chi vi abita sia di riconoscimento per coloro che vengono a visitare Recanati”. “Nella riqualificazione del Colle dell’Infinito la DEA ha avuto un ruolo indubbiamente importante sulla nuova illuminazione. I punti luce presenti nel Parco utilizzano la moderna tecnologia del led e sono gestiti individualmente, ciò vuol dire che sono modulabili e consentono un intervento singolo sul palo: ecco quindi la possibilità di realizzare con questa eterogenea gestione un gioco di luci che offre sul Colle effetti particolari in un luogo speciale. Il discorso del led era stato avviato dall’Azienda con la gestione della pubblica illuminazione, con l’obiettivo di ottenere un risparmio energetico; nel caso del Colle poter aver messo la firma come DEA in questo importante intervento è motivo di orgoglio e prestigio”. “Siamo davvero orgogliosi di aver contribuito concretamente alla riqualificazione di un luogo così rappresentativo per la nostra città natale. Grazie al prezioso sostegno del Comune di Recanati, a cui siamo legati da un solido rapporto di collaborazione e stima reciproca ormai ventennale, abbiamo messo ancora una volta la nostra tecnologia al servizio della collettività, trasformando il Parco dell’Infinito in uno spazio davvero emozionante e a misura d’uomo”. “Quello che ho voluto sottolineare è il contrasto romantico tra la luce lunare e quella artificiale che illuminano contemporaneamente la città, i suoi vicoli, le sue piazze, i suoi monumenti e le sue strade, fino ad arrivare al Colle dell’Infinito. In questo luogo era impossibile non provare a fare dei paralleli con la vita di uno dei suoi cittadini più illustri, quindi abbiamo provato a creare una luce poetica che spero possa valorizzare la bellezza dei luoghi leopardiani”. The solutions chosen by iGuzzini are a perfect combination of high energy efficiency technology, innovative design and attention to detail. They redesign the various ambiences of the Colle dell'Infinito while fully respecting its distinctive character. The iconic pole-top Fiamma luminaires, designed by Michele De Lucchi, indicate the entrances to the park, while the main street that skirts the Viale Colle dell’Infinito is illuminated by pole-top Twilight luminaires that guarantee uniform lighting on the horizontal plane while saving energy and reducing light pollution. The moonlight effect on the foliage of the trees in the avenue is created by Woody WGB luminaires. 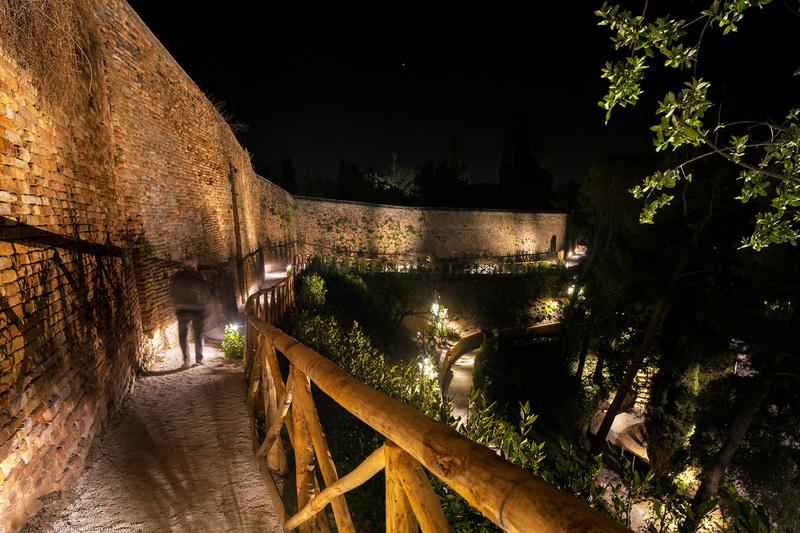 Inside the park, 610 and 250 mm iWay bollards illuminate the ground with a grazing light effect along the path that skirts the western walls of Saint Stephen’s Convent and the secondary panoramic paths. Palco InOut projector systems, with their compact, minimal design and Opti Beam technology optics, outline the silhouette of the convent wall and cenotaph. Light Up Earth luminaires fitted with adjustable Medium symmetrical optics illuminate the foliage of the evergreens from below, whereas wall washer effect, ground-recessed Light Up Earth luminaires with an outer casing, illuminate in a secondary phase the exedra in Via Monte Tabor. 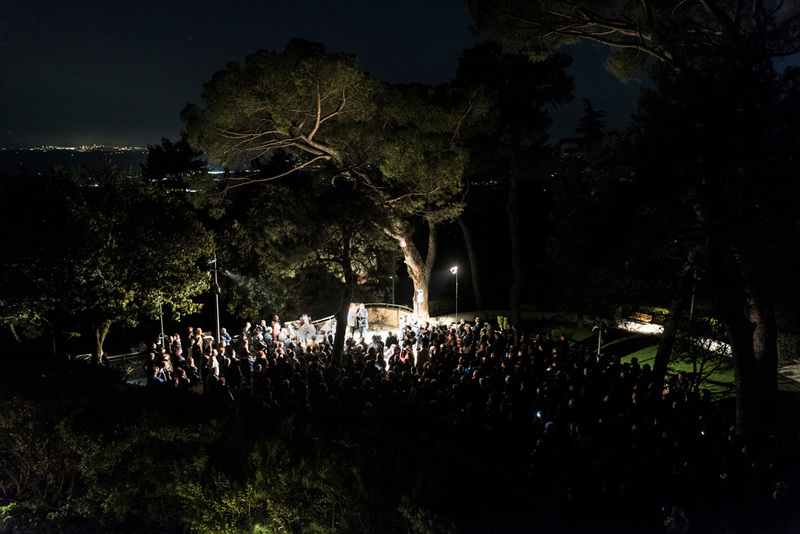 The park’s lighting system is completed by Woody and MaxiWoody projectors that also light the Colle dell'Infinito and the well-known inscription dedicated to Leopardi’s “solitary hill”.